Set a target of 198 runs to win, India chased down the total with the loss of just one wicket. India defeated Pakistan by nine wickets to lift the T20 World Cup for Blind title on Sunday in Bangalore. Set a target of 198 runs to win, India chased down the total with the loss of just one wicket and with 14 balls to spare. Opener Prakasha Jayaramaiah scored an unbeaten 99 to put India on course for the title. Badar Munir top scored for Pakistan with a 57-run knock. With the win, India has successfully defended the title they had won in 2012. Earlier, opting to bat first after winning the toss, Pakistan started brightly with opener Munir's half-century laying the ground for a big total. However, despite the bright start, Pakistan's middle-order stumbled later in their innings, as India restricted them to a total of 197/8 from the stipulated 20 overs. Ketan Patel and Jaffar Igbal picked two wickets each for India, while Ajay Kumar Reddy and Sunil R dismissed one each. India started the chase well, with openers Jayaramaiah and Ajay Kumar Reddy going all guns blazing early on. Reddy was dismissed for 43, while Ketan Patel had to retire hurt after scoring 26 runs. Jayaramaiah, however, continued his spectacular show with the bat, and with the help of Dunna Venkatesh, who scored 11, closed out the match in the 18th over. India finished with a score of 200/1 from 17.4 overs. This was the second edition of the tournament, with India having won the inaugural edition back in 2012. India had beaten Pakistan in the final of the 2012 tournament too, winning that match by 29 runs. Delighted that India won the Blind T20 World Cup. Congratulations to the team. India is proud of their accomplishment. Sports Minister Vijay Goel congratulated the Indian team for lifting T20 World Cup for Blind for the second successive edition after defeating arch-rivals Pakistan in the final at Bengaluru. In a message to the team, Goel said that the blind cricket team has added another chapter of glory in history of Indian sports. "After success of Para Athletes at Rio Paralympics 2016, Indian team for blind cricket has added another chapter of glory in history of Indian sports by retaining T20 World Cup," Goel said in a statement. Prime Minister Narendra Modi also joined the chorus of congratulating the Indian team. 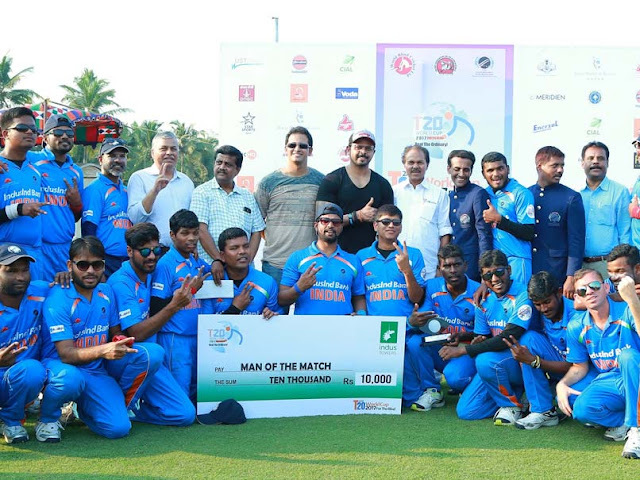 "Delighted that India won the Blind T20 World Cup. Congratulations to the team. India is proud of their accomplishment," Modi tweeted. Description: Set a target of 198 runs to win, India chased down the total with the loss of just one wicket. 1 Response to "India Beat Pakistan by 9 Wickets to Win T20 World Cup for Blind"